Shantae: Half-Genie Hero (game, 2016). A platform video game by WayForward Technologies/Pqube Games/Oizumi Amuzio Inc./Marvelous USA (XSEED). Developed by WayForward Technologies. Official Trailer. 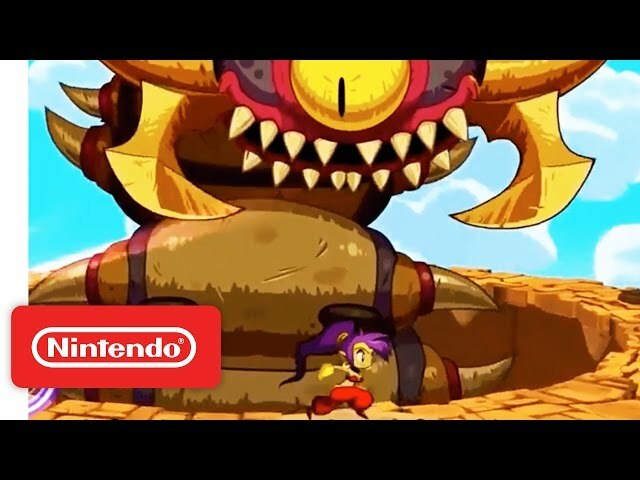 Shantae: Half-Genie Hero is a platform video game by WayForward Technologies, Marvelous USA (XSEED), Oizumi Amuzio Inc. and Pqube Games, developed by WayForward Technologies. 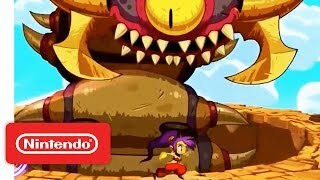 Shantae: Half-Genie Hero Launch Trailer. Late one night, the half-genie Shantae is awoken by the sound of a voice. Following it outside, she discovers a secret cave, where a messenger from the Genie Realm warns her of an impending evil that only she can defeat, but disappears before it can elaborate further. Shantae suddenly awakens, revealing the experience to have been a dream. She goes to visit her Uncle Mimic, who is working on a new invention, the Dynamo, which will keep Scuttle Town constantly powered and safe from attack. However, the pirate Risky Boots begins a siege on Scuttle Town, with one of her Tinkerbat minions stealing Mimic's blueprints. Shantae gives chase and defeats Risky, retrieving the blueprints, but Mayor Scuttlebutt once again fires her from her position as the town's guardian genie due to Risky's escape and the damage incurred. Mimic reveals that several components are still needed to complete the Dynamo, so Shantae begins searching across Sequin Land for the remaining components, helping those she finds in need of assistance along the way. With help from her friends Sky, Bolo and Rottytops, Shantae retrieves all of the components needed to finish the Dynamo. Mimic switches the device on, but the Dynamo goes haywire and blasts Shantae with dark magic, turning her to her Nega-Shantae form. Risky appears and reveals she had swapped Mimic's blueprints with her own, and that she plans to power up the machine and use it to invert the magical polarity of the entire Genie Realm, turning them evil. Shantae attacks the group while Risky escapes with the Dynamo in tow, but Shantae's friends manage to snap her out of her trance, returning her to normal. To prevent Risky's plan, Mimic creates a Magical Polarizer to reverse the Dynamo's effects, and Shantae sets out for Risky's hideout. Upon arrival, Shantae defeats Risky and the Dynamo-powered Tinkerbrain, but the messenger from her dream pulls her into the Genie Realm and reveals their magic has already been corrupted. With no choice left, Shantae decides she must destroy the Genie Realm to keep the world safe and destroys the repowered Tinkerbrain, returning to the real world and escaping the exploding hideout as Risky swears vengeance. Like the previous installments of the series, the player takes control of Shantae, a half-genie who can use her hair as a whip to attack enemies. Throughout the game, Shantae can obtain dances that allow her to transform into various forms, each with their own abilities that can access otherwise inaccessible areas. Along with returning transformations, such as the monkey and elephant, new forms include a bat that can cross long gaps, a crab that can maneuver underwater, and a mouse that can crawl into small mazes. These transformations can be further upgraded with new abilities. The game is divided up into several action stages, which can be replayed to obtain new items that become accessible with the use of certain powers, some of which are required to progress through the story. The magic meter system from Risky's Revenge returns, which allows Shantae to use unlocked spells at will instead of purchasing them individually. The game is presented in high definition, with 2D vector character sprites on 3D environments, unlike previous entries' dedicated pixel art aesthetic. Shantae: Half-Genie Hero was scheduled to be released by WayForward Technologies, Pqube Games, Oizumi Amuzio Inc. and Marvelous USA (XSEED) on December 20, 2016 and on June 8, 2017. This video game is available for the following platforms: Microsoft Windows, PlayStation 4, PlayStation Vita, Wii U, Xbox One and Nintendo Switch.